The third edition of the best selling collection, Chicano School Failure and Success presents a complete and comprehensive review of the multiple and complex issues affecting Chicano students today. Richly informative and accessibly written, this edition includes completely revised and updated chapters that incorporate recent scholarship and research on the current realities of the Chicano school experience. It features four entirely new chapters on important topics such as la Chicana, two way dual language education, higher education, and gifted Chicano students. Contributors to this edition include experts in fields ranging from higher education, bilingual education, special education, gifted education, educational psychology, and anthropology. 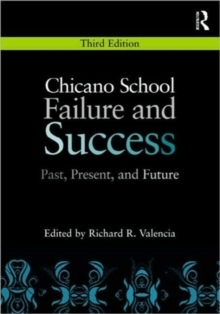 In order to capture the broad nature of Chicano school failure and success, contributors provide an in-depth look at topics as diverse as Chicano student dropout rates, the relationship between Chicano families and schools, and the impact of standards-based school reform and deficit thinking on Chicano student achievement. Committed to understanding the plight and improvement of schooling for Chicanos, this timely new edition addresses all the latest issues in Chicano education and will be a valued resource for students, educators, researchers, policy makers, and community activists alike.